The onset, degree, and sequence of aging varies based upon a multiplicity of factors. These include genetic background and ethnicity, environmental conditions, behavior, and overall quality of life including socioeconomic level. Both intrinsic and extrinsic factors contribute to aging. Intrinsic factors include progressive bone remodeling, loss of facial fullness, and decreased tissue elasticity. Major extrinsic forces include gravity, hormonal imbalances, diet, smoking, and chronic solar exposure . Although each factor reflects its own respective changes, these factors combine dynamically to determine the totality of facial changes. Rhytidectomy is used as one important tool in facial rejuvenation. Historically, rhytidectomy encompassed only skin re-draping procedures. Later, deeper facial structures were addressed with procedures that involved the superficial musculoaponeurotic system. More recently, procedures that address both the descent of tissues and the loss of volume have proven effective. Successful implementation of these techniques, however, requires implementation of a preoperative surgical plan. Such a plan requires a methodical analysis of the tissue layers as well as the manner in which the individual structures of the face relate to each other. In order to develop a successful treatment plan, the surgeon must include a careful and systematic facial analysis. Without a surgical plan that includes a careful and systematic facial analysis, a less than optimum surgical result is likely, even in the most highly skilled hands. The changes associated with facial aging can be seen in the images below. Figure 2. Changes associated with facial aging, including jowling, midfacial ptosis, pseudoherniation, and dermatochalasis of the lower lids and descent of the brows. Note the deepening of the nasolabial folds as well as the appearance of labiomandibular folds ("marionette lines"). As more patients seek facial rejuvenation, the importance of identifying appropriate candidates is amplified. The ideal patient is one who is physically and emotionally healthy and can identify specific areas of concern for which correction is sought. Developing a thorough understanding of the patient’s goals by attentively listening to the patient’s concerns and successfully developing patient rapport is critical. A clear understanding of the patient’s desires and expectations is of utmost importance in developing a treatment plan. Use of a mirror during the initial consultation facilitates communication by allowing the patient to identify specific areas of concern and allows the surgeon to manually demonstrate anticipated surgical results. A thorough clinical history is mandatory. Special emphasis is placed on any medical problems that may adversely impact the surgical result or place the patient at undue risk. These problems include a cardiovascular history such as hypertension, coronary artery disease, and cerebrovascular disease and stroke. Any history of coagulopathy should be investigated, including occurrence of deep venous thrombosis, pulmonary embolus, or bleeding disorders. Other pertinent history includes pulmonary disease, autoimmune disease, and skin or connective tissue disorders. Disorders that may delay healing such as diabetes and hypothyroidism should be explored. Patients with multiple medical problems should be evaluated by their primary care physician preoperatively. A complete list of the patient’s medications, including any supplements, is reviewed. All anticoagulants, such as nonsteroidal anti-inflammatory agents and certain supplements should be discontinued prior to surgery. Eliciting any history of tobacco use is important. Smokers are not usually appropriate candidates for rhytidectomy, because smoking may delay healing time and increase risk of skin flap necrosis. Any exception requires a minimum of 2 weeks of smoking cessation prior to surgery. Head, neck, or cosmetic surgery and any anesthetic complications are noted and addressed. Previous radiation to the head and neck is a contraindication to facelift. Psychosocial history should be evaluated. Thirty percent of patients undergoing facial cosmetic surgery are estimated to be suffering from some form of depression. An in-depth discussion and, when appropriate, a psychological consult helps ensure that the patient’s goals are realistic. In this regard, understanding the patient's motivation is critical. Facial cosmetic surgery is an ineffective remedy for relationship issues. Referral for behavioral health evaluation and counseling can be an important adjunct in management of any mental health concerns that may arise with respect to any specific patient’s motivation to seek cosmetic surgery. Younger age, males, and exaggeration of minimal deformities have been identified as factors associated with poor psychosocial outcomes. A history of depression, anxiety, personality disorders, or body dysmorphic disorder may be predictors of a poor outcome. A complete head and neck examination is performed emphasizing areas of concern. Attention is paid to any facial asymmetries and to descent and distribution of facial soft tissue and fat. The skin is thoroughly evaluated for signs of photoaging and for degree of elasticity and laxity. Any suspicious cutaneous lesions should be biopsied or referred for further evaluation. The facial skeleton is visually and manually inspected, particularly for signs of atrophy. Dental occlusions and chin position are also evaluated. The neck is evaluated for platysmal banding, liposis, jowling, and hyoid position. A thorough examination also includes palpation of the salivary glands and neck to identify masses and to evaluate for submandibular gland hypertrophy, which will not be corrected in a standard rhytidectomy. Photodocumentation is an important tool in managing the cosmetic surgery patient. Standardized photography provides a consistent means of analyzing the patient both preoperatively and postoperatively and plays a key role in treatment planning. Still photographs, together with computer imaging programs that illustrate anticipated surgical changes, may also be used as a counseling tool, further facilitating effective communication with the patient. Rhytidectomy photographs at a minimum consist of the standard 5-view series: anterior, left and right oblique, and left and right lateral views. The surgeon may consider animated views, such as smiling and grimacing, to demonstrate specific areas of concern. Close-up views of scars from any previous surgery or trauma should be included in the patient’s record. Evaluating not only the aging effects of the individual tissue layers but also each horizontal third of the face is important. From one location of the head or neck to another, skin varies in both thickness and adherence to underlying tissues. Aging results in a progressive thinning and loss of the elasticity of the skin. Gradual reduction in collagen is the major determinant of reduced skin thickness. Deterioration of the organization of the elastic fibers occurs over time and leads to decreased elastic recoil and sagging skin. As aging progresses, repeated facial muscular activity gives rise to dynamic rhytides, which eventually progress to static rhytides. This thinning and loss of elasticity allows underlying anatomic structures to become more individually discernible. Thus, fat pockets, submandibular glands, and bony protuberances become more visibly pronounced. Extrinsic factors, such as smoking and sun exposure, also act on the skin to result in dysplasia of keratinocytes, coarse rhytides, and irregular skin textures. One should pay particular attention to skin thickness in an individual patient. Thin skin generally heals better with less scarring but may show contour irregularities more easily. The youthful face is characterized by volume, balance, and distribution of superficial and deep fat. Facial aging is associated with loss of soft tissue fullness in certain areas, and descent or hypertrophy in others. An overall loss of volume occurs in the periorbital, forehead, malar, temples, mandibular, mental, glabellar, and perioral sites, while hypertrophy of fat occurs in the submental lateral nasolabial folds, and labiomental crease, jowls, infraorbital pouches, and malar fat pad. Gradual relaxation of the ligamentous support leads to descent and separation of the fat pads. A controversy exists as to whether this decreased structural support is a gravity caused laxity leading to elongation of the ligament or a perceived elongation as the surrounding tissue volume decreases moving the vector of the ligament more inferiorly. Remodeling of the craniofacial skeleton leads to a reduction in facial height, decreasing the space available to support the overlying soft tissues, and causing the face to collapse in on itself. The orbits increase in diameter as the orbital shelf descends, thus decreasing the ratio of maxillary height to orbital height. This loss in height contributes to the malposition of the lower eyelid, leading to lateral bowing and scleral show. Maxillary resorption causes loss of support in the upper lip, which contributes to perioral wrinkling. In the mandible, tooth loss leads to atrophy of the alveolar ridge, and, therefore, loss of structural support of the lips. Overall, the protuberances at the insertion sites of the muscles of mastication become more pronounced, while the rest of the craniofacial skeleton generally coarsens. The face is commonly divided into horizontal thirds from trichion to glabella, glabella to subnasale, and subnasale to menton (see the image below). Each third should be of equal height. The face is also divided into vertical fifths, with each fifth roughly the width of one eye. 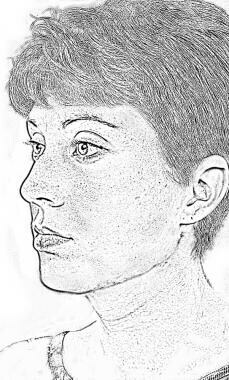 The face should also be divided in the midline and evaluated for significant asymmetry. Horizontal thirds of the face: trichion to glabella, glabella to subnasale, and subnasale to menton. The upper one third of the face extends from the trichion to the glabella. In the youthful face, the ideal nasofrontal ranges from 30-46°. The ideal female brow should rest slightly above the supraorbital rim. The medial and lateral extents of the brow should fall on the same horizontal line with a peak superior to the lateral canthus. The middle third is measured from the glabella to the subnasale. In the youthful face, well-supported facial fat is located overlying the malar eminence and along the lateral cheek. The nasolabial angle should be in the range of 90-120°. The lower one third of the face extends from the subnasale to the menton. For evaluation of lip position, the lower third of the face can be again divided into thirds, the upper third from the subnasale to the stomion, and the lower two thirds from the stomion to the gnathion. The mentolabial sulcus depth is assessed by creating a line from the lower vermilion border to the pogonion. The sulcus should lie approximately 4 mm behind this line. The aging of the upper third of the face leads to a loss of subcutaneous fullness in the forehead, brow, temple, and upper eyelid areas, which accentuates the underlying anatomic structures. The loss of subcutaneous tissue and thinning of the skin allows the bony outline of the skull, superior orbital rims, muscles of the brow, and temporal vessels to become more evident. Flattening of the medial forehead causes blunting of the nasofrontal angle and gives the illusion of increased nasal length. The eyebrows slowly descend from a position above the superior orbital rim. This ptosis of the brow combines with the excess skin of the upper eyelids and weakening of the underlying orbital septum to allow protrusion of the intraorbital fat and a bony appearing orbit. Each of these components should be evaluated individually and with respect to symmetry. For example, asymmetric brow ptosis, which should be pointed out to the patient preoperatively, is not uncommon. Over time, the fullness in the glabella, nasion, and upper nasal dorsum diminishes. The cartilaginous nasal framework weakens, causing progressive ptosis of the nasal tip. This ptosis is further emphasized by pyriform remodeling, narrowing at the alar base, and the resorption of the upper maxillary. These changes produce a narrowing of the nasolabial angle. Fat volume in the youthful cheek varies, but typically a gentle rounded malar mound that overlies the zygomatic maxillary area is found. A gradual redistribution of the cheek fat takes place as the face ages. This redistribution is caused by downward migration of malar fat with loss of thickness in the infraorbital location and increased thickening of the fat at the nasolabial fold. Chronic tissue expansion with stretching of the fascial dermal septa within the malar fat pad results in loss of support for the cheek fat. In other words, the malar fat pad gradually slides forward and down to bulge against the nasolabial crease, giving rise to the prominence of the nasolabial fold and leaving behind a hollowed cheek. In the aging lower face, an excess of skin develops due to increasing skin laxity, depletion of malar and perioral fat deposits, and reabsorption of alveolar bone. Sagging skin combined with loss of masseteric ligament support allows descent of the facial fat to the mandibular border, forming the facial jowls. As aging progresses, the anterior edges of the platysma muscles lose tone and separate, creating a characteristic banding. Herniation of submental fat between these bands can result in further loss of the cervicomental angle. Loss of this angle produces the appearance of a “turkey gobbler” neck. The mandible reabsorbs, allowing chin pad ptosis and contributing to the illusion of increased nasal projection. Especially in the edentulous patient, the resorption of the alveolar ridge causes a relative excess of skin. This excess skin, when combined with loss of the subcutaneous tissues, reveals the intrinsic tone in the orbicularis ori muscle, forming perioral rhytides and marionette lines. Upward resorption of the mandibular border leads to exposure of the submental contents, most notably the submandibular glands. As the lateral mandibular fullness dissolves, the definition of the angle of mandible to buccal fat pads disappears and seems to merge into the neck. Although individual surgical techniques and an in-depth discussion of each of the many options for cervicofacial rhytidectomy are beyond the scope of this article, the authors want to emphasize that the particular procedure chosen for the patient should be individualized. With many options for facial rejuvenation, no single procedure will suit all patients (see the image below). 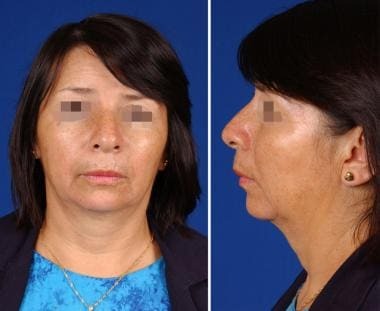 A 64-year-old woman with characteristic facial aging. She displays significant photoaging with bilateral deepening of her nasolabial folds, early marionette lines, platysmal banding, and jowling. The term "facelift" is actually a misnomer; the operation is really a cheek and neck lift. The benefits of the facelift operation are limited to tightening and resupporting the lower two thirds of the face. The facelift counters the effects of gravity by removing excessive skin that has been loosened and pulled down, and it tightens the deep layers to resupport sagging musculature and fascia. Here, the primary pathology is ptosis and an excess of facial soft tissues, precisely the situation best addressed by surgical repositioning techniques, including a facelift. However, patients who are candidates for facelift often desire rejuvenation of multiple levels of the face. These areas are addressed in a manner to provide an overall harmonious appearance with a natural result. The patient should be advised that addressing the lower two-thirds of the face with rhytidectomy alone may make the upper third of the face appear aged in comparison. Thus, the patient may want to consider the upper third of the face rejuvenation as well through browlift, blepharoplasty, volume enhancement, and/or neuromodulators such as Botox®. Certain cervicofacial characteristics are more favorable for successful facelift results. These include a strong chin and a prominent skeletal framework, full midface, sharp cervicomental angle, and minimal photoaging. Unfavorable characteristics include a weak chin, deep labiomandibular folds, low positioned hyoid bone, and a hypoplastic maxilla and deficient midfacial soft tissue (see the image below). Thin, atrophic, and severely photoaged skin is also less likely to yield a favorable result. Perioral rhytides on close-up view. She is an excellent candidate for a rhytidectomy but may elect to have a facial resurfacing procedure at a later date. Perioral laser resurfacing may be performed at the same time as a rhytidectomy without risk of skin flap necrosis. 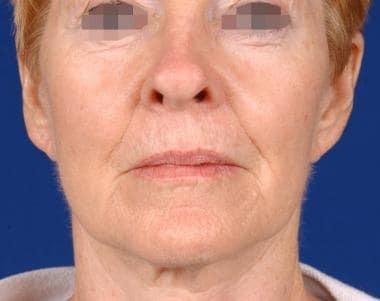 The younger patient with minimal jowling may be a candidate for a “mini-facelift” alone, whereas the older patient may desire a more formal rhytidectomy such as a SMAS rhytidectomy or deep-plane facelift (see the image below). Advocates of the deep-plane rhytidectomy cite improved appearance of the nasolabial fold as well as a longer-lasting result. The lateral SMAS-ectomy and other procedures that address the SMAS without a deep plane dissection are thought by many authors to achieve similar results to the deep plane lift. Although some controversy exists as to which of these give the best result, the procedure that provides the most reliable and consistent results for the surgeon is often the best choice. These choices, however, do not always satisfactorily address the nasolabial fold and at times can cause a more prominent deepening of this area. 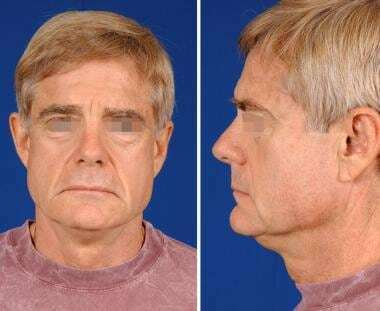 A 58-year-old man with premature aging, demonstrating marked brow ptosis and dermatochalasis, mid-face descent with deepening of the nasolabial folds, jowling, and submental laxity and liposis. Procedures to address the nasolabial fold and midface ptosis have been gaining popularity. These include endoscopic approaches with trans-temporal suspension and trans-blepharoplasty approaches such as the “SOOF” lift. These procedures may be used alone or in combination with more traditional facelifting techniques. Considering volume depletion and fat atrophy as a component of aging is important (see the image below). When surgical procedures are used to reposition the skin without volume enhancement in a patient with significant subcutaneous tissue atrophy, a tight unnatural appearance may result. Volume replacement can be accomplished through fat augmentation or through injection of soft tissue filler substances such as hyaluronic acid (Restylane, Juvederm) or calcium hydroxylapatite (Radiesse). One may also consider alloplastic implants in patients with significant skeletal atrophy. A Patient with aging of the lower face. 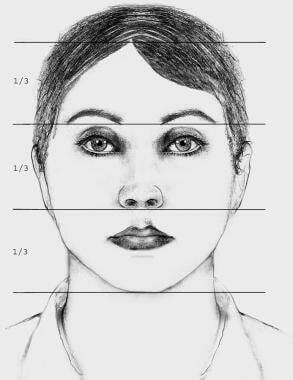 In addition to jowling and laxity of her submentum and upper neck, she has significant microgenia. Genial augmentation, in addition to rhytidectomy, would assist in improving her cervicomental contour. Intrinsic defects in the tissues themselves are not well addressed by suspension rhytidectomy. Concomitant with the ptosis described above, aging brings about many changes in the skin. Fine lines and deeply etched wrinkles in the skin are the grossly visible correlate of crevices in the dermis and subcutaneous tissues formed over time as a result of actinic damage, senescence of connective tissues, and habitual facial expressions. These cosmetic defects are minimally improved, at best, by rhytidectomy. Instead, they can be addressed more directly by resurfacing techniques, including both chemical and laser exfoliation. In situations for which intrinsic properties of the skin comprise a significant portion of the aesthetic problem, the patient should be encouraged to consider skin resurfacing as an adjunct or, in some cases, as an alternative to rhytidectomy. Resurfacing procedures which involve the area over elevated flaps are generally offered a few months after rhytidectomy to decrease the risk of skin flap necrosis. The neck should be managed along with the lower two thirds of the face. Clearly identifying any problem areas such as low hyoid position and marked submental liposis is important. If a patient is planning to lose weight, this should be done prior to facial rejuvenation to ensure the best possible result and to avoid the potential for revision surgery. Low hyoid position often can not adequately be corrected with facial surgery. Adjunctive procedures such as submental liposuction or lipectomy and platysmaplasty improve cervicomental contour. If the patient is noted to have microgenia, a chin implant may be necessary (see the image below). Other occlusal abnormalities may require orthognathic surgery for correction. Less than ideal facelift candidate who has a heavy face and jowls. Incision placement is another component of preoperative counseling. The patient should clearly understand the location of anticipated incisions. Incision lines should be camouflaged as much as possible. The authors prefer a post-tragal incision in women that hides well on the anterior of the ear. The authors generally prefer a pretragal incision in men to avoid repositioning of beard hair retro-tragally. However, if a male patient prefers this incision, the beard hair may be addressed with laser hair removal. No tension should be placed on the tragus to avoid a blunting appearance. In addition, no tension should be placed on skin flaps during closure to avoid scar hypertrophy. The lobule should be placed tension free in an appropriate anatomic position to avoid a “pixie” or “satyr ear” deformity. The hairline incisions should be individualized. Anteriorly, if the hairline at the inferior aspect of the sideburn lies below the level of the helical root, the incision is generally started in the temporal tuft to allow posterior-superior rotation of the skin flap in the temporal region. To avoid elevating the temporal tuft too high, the incision is begun along the inferior aspect of the sideburn if this level is above the root of the helix. Posteriorly, the incision may be made along the hairline. However, this incision may show when the female patient wears her hair up. For this reason, we often carry the incision postauricularly into the hair at a level along a line extended posteriorly at the level of the helical root. Meticulous care should be taken to avoid a step-off when repositioning the hairline. 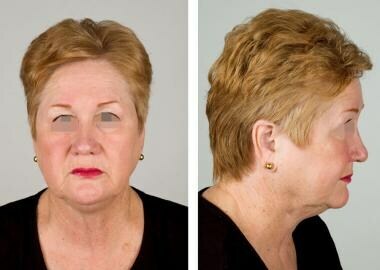 Successful facelift surgery begins with clear communication and building an effective rapport with the patient. A systematic facial analysis is critically important for surgical planning. Numerous potential pitfalls can be identified and complications can be avoided by correlating the patient’s concerns with the individual’s facial anatomy in order to develop a realistic goal. Dhir K, Lawson W, Binder WJ. Zonal analysis of facial asymmetry and its clinical significance in facial plastic surgery. JAMA Facial Plast Surg. 2013 Mar 1. 15(2):110-2. [Medline]. Tan SL, Brandt MG, Yeung JC, Doyle PC, Moore CC. The aesthetic unit principle of facial aging. JAMA Facial Plast Surg. 2015 Jan-Feb. 17 (1):33-8. [Medline]. Fitzpatrick TB. The validity and practicality of sun-reactive skin types I through VI. Arch Dermatol. 1988 Jun. 124(6):869-71. [Medline]. Coleman SR, Grover R. The anatomy of the aging face: volume loss and changes in 3-dimensional topography. Aesthet Surg J. 2006 Jan-Feb. 26(1S):S4-9. [Medline]. Donath AS, Glasgold RA, Glasgold MJ. Volume loss versus gravity: new concepts in facial aging. Curr Opin Otolaryngol Head Neck Surg. 2007 Aug. 15(4):238-43. [Medline]. Henderson JL, Larrabee WF Jr. Analysis of the upper face and selection of rejuvenation techniques. Facial Plast Surg Clin North Am. 2006 Aug. 14(3):153-8. [Medline]. Henderson JL, Larrabee WF Jr, Krieger BD. Photographic standards for facial plastic surgery. Arch Facial Plast Surg. 2005 Sep-Oct. 7(5):331-3. [Medline]. Honigman RJ, Phillips KA, Castle DJ. A review of psychosocial outcomes for patients seeking cosmetic surgery. Plast Reconstr Surg. 2004 Apr 1. 113(4):1229-37. [Medline]. Owsley JQ, Roberts CL. Some anatomical observations on midface aging and long-term results of surgical treatment. Plast Reconstr Surg. 2008 Jan. 121(1):258-68. [Medline]. Same patient after rhytidectomy, endoscopic brow lift and upper lid blepharoplasty. Middle-aged female with skin laxity and characteristic aging face. This patient has a significant degree of facial fat atrophy and would benefit from volume replacement either with fat augmentation or soft tissue fillers. Improvement of lower face laxity after rhytidectomy. This patient declined augmentation procedures. Preoperative (A, C, E) and postoperative (B, D, E) views of a good facelift candidate. This patient has good bone structure, limited facial and neck liposis, and a moderate degree of soft tissue ptosis. 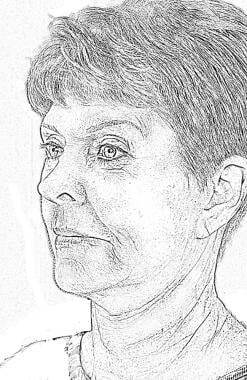 A, D: Preoperative views of patient with mild soft tissue ptosis in the neck and jowls and actinic damage with rhytide formation throughout the face. B, E: Postoperative views of same patient after rhytidectomy. C, F: Postoperative views following full-face laser resurfacing and endoscopic brow lift performed 3 months after rhytidectomy. Note that laser resurfacing significantly enhances the final result. A, C, E: Preoperative views of patient with soft tissue ptosis in the neck and jowls, upper and lower eyelid blepharochalasis, and brow ptosis. B, D, F: Postoperative views of the same patient after facelift, upper and lower eyelid blepharoplasties, and endoscopic forehead lift. Note that rejuvenation of both the lower and upper halves of the face contribute substantively to the overall sense of esthetic improvement. Here, a combination of procedures is optimal for a harmonious result. A, C, E: Preoperative views of typical facelift candidate with microgenia. 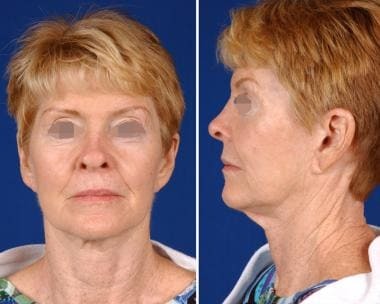 B, D, F: Postoperative views of the same patient after facelift and chin augmentation. Note the significant improvement in the cervicomental contour that would not be possible without chin advancement. Preoperative (A) and postoperative (B) views of a facelift patient with favorable hyoid position. Compare with the next image. Preoperative (A) and postoperative (B) views of a facelift patient with unfavorable hyoid position. Compare with previous image. The difference in results between these patients reflects less upon the technique used than on the underlying laryngeal position. The authors would like to thank Earl J. Peck, JD, for his assistance in preparation of this manuscript. Also, the authors and editors of Medscape Reference gratefully acknowledge the contributions of previous author Roger E. Horioglu, MD, to the development and writing of this article.